Although this is the preferred entrance for family use, it’s actually the service entrance of the home. 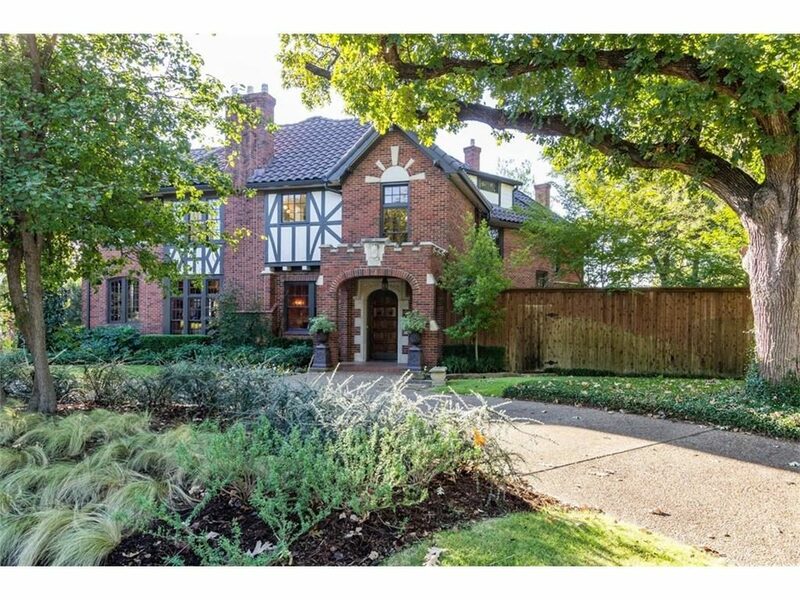 The Dines and Kraft Tudor at 6861 Lakewood Boulevard is, without a doubt, one of the most beloved homes in Lakewood — and it’s finally for sale again. 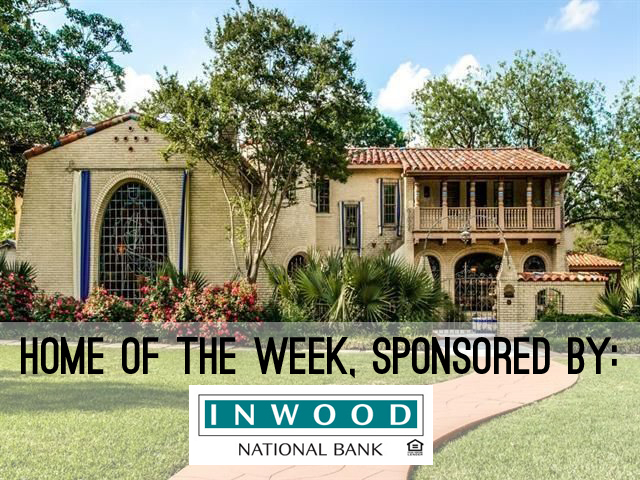 It was just listed by Annamari Lannon of Allie Beth Allman for $1.249 million, and that is a great price for a home of this caliber. Best. Christmas gift. Ever: a Hutsell for under $450,000! If you don’t know what a Hutsell is, shame on you. Architect Clifford Hutsell built homes that make Lakewood, well, Lakewood. 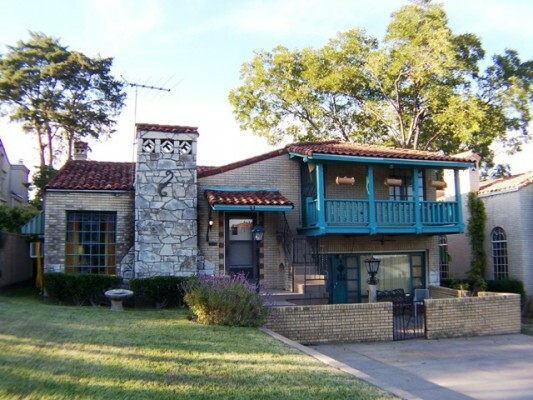 When you see tile roofs, arches, eclectic detail and exterior stairs leading to second floor colorful balconies, you know you’re gazing at Dallas history. 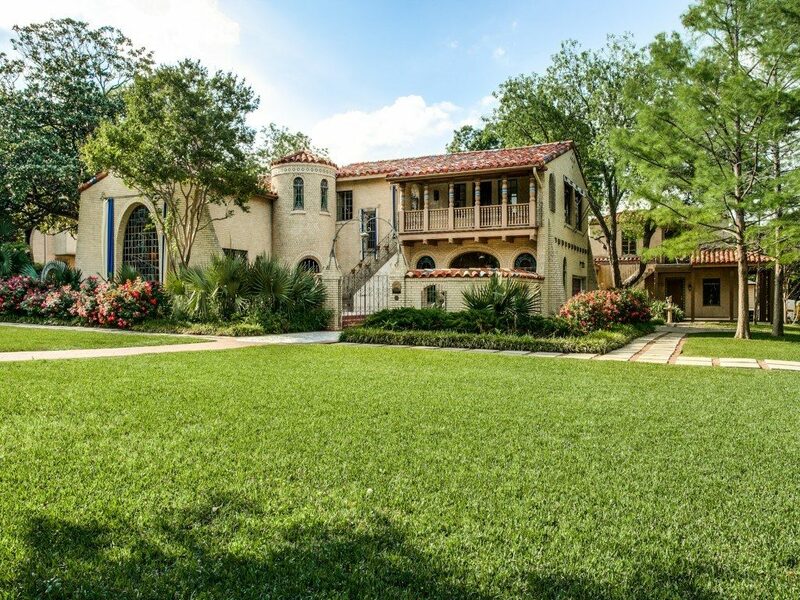 A lot of these homes are fairly large and fairly expensive, but this one is neither. All are memorable. This intimate house at 7327 Lakewood has three bedrooms, two baths in just over 1800 square feet. Great pedigree but it does, however, need a buyer with vision, taste, style and common sense. Someone like a smart young architect (Eddie Maestri, I know you are up for this challenge) to love it back into shape. My heart about leapt out of my chest when I heard there was a Hutsell available for $439,000 and I called my broker. We’re talking tons of plus factors on this baby. Original rope detail, tile to die for and the sought after round window! 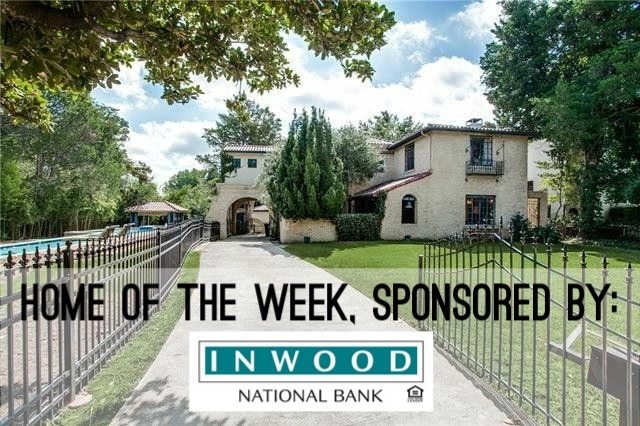 There are arches galore, the must have metal interior gate and, to top it off, incredible views of White Rock Lake! I scampered around this cozy cottage like a kid uncovering treasures. The living and dining rooms are gorgeous. Original sconces grace the fireplace. The wall troweling looks like soft cake frosting swirls. When I headed into the kitchen it was all I could do not to whip out my trusty mat knife and peel back the lino laid during a disastrous 1960’s kitchen redo. I know there must be something wonderful hidden underneath. Yes, a new kitchen is in order but “no big thang”. So of course I called up uber construction consultant and designer, Carol Gantt who is a legend in Lakewood for rehabbing Hutsells, having brought a number of them back to life. The garage was turned into a paneled den years ago, complete with picture window. That’s the bad news. The good news is it has original side windows and I can see laying tile to create an incredible sunroom here and doing it without spending a bundle. There’s a fab little downstairs bedroom with one of the most beautiful intact period tile floors in Dallas. It’s a great place to keep your teenager far away from you, then turn it into a home office once he goes to college. Oh yes, am I seeing myself here already? 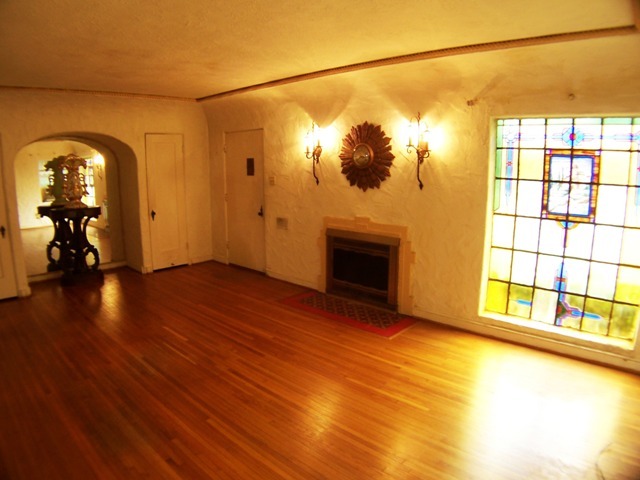 The upstairs “master” had that lovely round window replaced with (drum roll)….a mirror. I know, where are the Tums? Quick fix. The present master shares a Jack and Jill bathroom with a second bedroom. 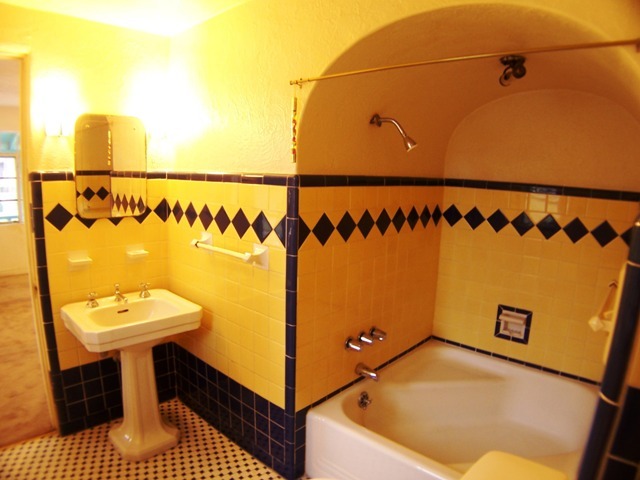 Once upon a time it was OK for kids to share baths, now that all but guarantees ten years of analysis. So what will make this work for a modern family? Gantt believes the original house could be rehabbed with a new den and kitchen added off the back, making the dining room an interior room. “Above that I’d probably create a master suite accessed up a short staircase,” she said. “That way the original home would be almost completely preserved while adding value and functionality for the way people use a house today. Leaving the original baths and bedrooms intact would mean less money spent on things that did not result in more square footage. That makes more sense from an investment standpoint as long as the additional square feet honor the original materials and room scale. I think that’s what makes it so special and the more of that you tear out, the less special it becomes. Whoever restores this house will need to bone up on the right way to renovate a historic property to ensure they get the most out of their investment. You just don’t muck about with Hutsells.